With Christmas on the way everybody here at The Custard TV is fully anticipating the festive schedule as we look forward to what television has to offer us in the last few weeks of December. But the build-up to Christmas is famous for something else, the adverts. I feel that we all have our memories of favourite Christmas ads with my personal recollections being Coca Cola's 'Holidays are Coming' and Toys 'R' Us' 'There's Millions Says Geoffrey all Under One Roof.' Today the premieres of some Christmas adverts are treated the same as the openers of TV series and one in particular got an advert break entirely devoted to it. In this article I look at this year's hits, misses and my personal favourite of the Christmas TV adverts. From their first Christmas advert in 2007, John Lewis have used a blend of melodic cover versions and filmic cinematography to create memorable commercials. Last year's snowman campaign was one of my favourites and was visually breathtaking to watch. 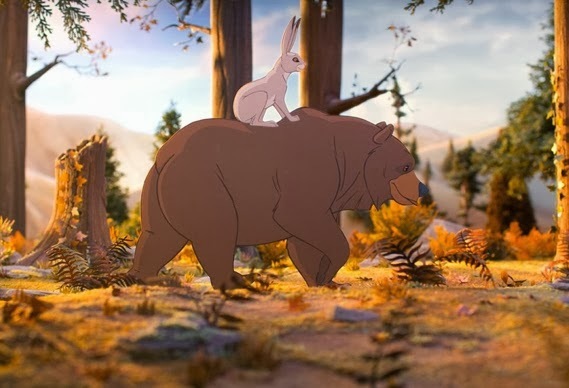 For 2013's advert John Lewis have created an animated film which tells the story of a bear hibernating through Christmas and his hare friend who wants him to celebrate the day with him. The advert's most memorable quality is Lily Allen's cover version of Keane's 'Somewhere only We Know' but I have to say I'm not a fan of the story. I just feel it lacks the emotional punch of some of the store's previous campaigns but I can see younger audiences and families really enjoying it. Rather than just have a collection of famous ladies model their clobber, Marks have really surpassed themselves with a fairytale advert. The story sees Rosie Huntington-Whiteley experience Alice in Wonderland, Aladdin and The Wizard of Oz while eating the store's food and wearing their clothes. Just to make the advert feel a little bit more like a Tim Burton film, his wife Helena Bonham Carter pops up towards the end. Even though I think it's a little excessive to see Rosie in her knickers on two separate occasions, the advert has combined the right amount of visual flair and intrigue to make me remember this advert after its finished airing. The same can't be said for Debenhams advert which simply features models doing wintry stuff accompanied by the song 'Youth' by Foxes. In fact every time it comes on the TV I forget which store it's an advert for and have to wait till the end to find out. The advert seems cheap when compared with the two I've already mentioned and at the end of the day it doesn't give me anything that I can't already see in the store's catalogue. This year the supermarket have gone for the old favourite - the family throughout the years. The tactic was memorably used for John Lewis' 'She's Always a Woman to Me' ad several years ago and its similarly emotional here. Using the narrative device of a series of home movies we see a couple experience Christmas over a number of years as they become parents and then grandparents. Despite all the changes to their family, the one constant is that they by their food from Tescos every year making them creatures of habit. I have to say I had to search this one out online as I haven't really seen it on the TV as of yet but for me this has more emotional appeal than the John Lewis commercial. At the same time I can't really say it makes me want to buy anything for Tesco. Like Tesco, Sainsbury's have focused on the family unit by creating a 45 minute film entitled 'Christmas in a Day'. The film is directed by Kevin MacDonald, who previously helmed Life in a Day and Britain in a Day, and will premiere on November 28th at the BAFTA cinema. Meanwhile, the ads themselves will act as mini trailers for the films, with the most memorable being the soldier unexpectedly returning home from Afghanistan to be with his surprised family. Though the film itself is an interesting idea, I feel these adverts are lacking a little context and really don't tell me much about what I can expect from Sainsbury's this year. Employing the Kiss Princle, as in Keep it Simple Stupid, Asda's advert simply has four snowmen representing the big four supermarkets. Obviously, due to Asda's outstanding prices, their snowman is the most impressive therefore signalling that they're the best supermarket. Forgoing any outlandish campaign, Asda's advert is refreshing though at the same time it's not entirely memorable. The only supermarket to employ star names in their advert, Morrisons continues to try and make their investment in Ant and Dec worthwhile. What I don't understand is why the Geordie duo are being upstaged by a singing gingerbread man in this take on Beauty and The Beast's 'Be Our Guest'. Ant and Dec's job here is simply to react to the song and to provide the advert's final punchline. I rather feel that they've missed a trick here as Morrisons could've capitalised on Ant and Dec's participation a lot more. Having said that, of the big four supermarkets, Morrisons is the only one to show what the store actually has to buy this Christmas and some of the food does look quite enticing. The Boots advert is my personal favourite this year for a number of reasons. Firstly, at just over a minute in length, it doesn't outstay its welcome. Secondly, the story is easy to understand and is well told as we learn the boy who we previously thought was a thug is actually giving presents to the people who've helped him. Most importantly of all I found this advert to be packed full of emotion while it also puts Boots' products front and centre. While it's not always completely realistic, for example I can't understand why he'd give his teacher a present if he only managed to get a B in maths, to me it does ring quite true. The inclusion of Bronski Beat's 'Smalltown Boy' gives the advert an edge and overall I just feel this simple but effective advert wins the battle of the Christmas commercials in 2013. What do you think of this year's Christmas adverts? Which is your favourite? Are there any I've left out? Get in touch with me @mattstvbites and let me know.